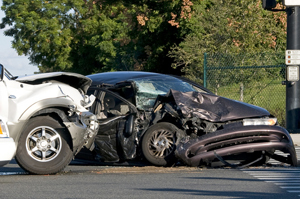 T-Bone collisions, or “side impact collisions” are the second deadliest, and second most devastating type of car accident after head on collisions. A t-bone collision is when one car drives head on into the side of another car, causing a “t” type formation. Hence the name “t-bone” collision”. It’s estimated that around 25% of car accidents in Toronto, London and Peterborough are categorized as t-bone collisions. Sometimes, t-bone collisions do not cause any injuries whatsoever. That makes perfect sense. If you’re driving alone without any passengers, and your car gets t-boned at a relatively low speed on the passenger side of the door, it’s conceivable that the driver would not sustain any injuries because the opposite side of the car absorbed all of the shock and impact. T-bone collisions can be caused by drunk drivers, drivers running red lights, drivers running stop signs, or other negligence by drivers who simply aren’t paying attention to the road. The police often get involved in charging the negligent driver in relation to these accidents, because the wrongdoing of the other driver is so apparent; and they need to be held accountable for their mistakes. Goldfinger Injury Lawyers assists the police with each step of their investigation. Our law firm is also able to recover the complete police file after the case has closed, which includes the Crown Brief, the police officer’s notes, any accident reconstruction reports, the names and addresses of any witnesses, and any statements from the drivers or witnesses. These materials are made available to our lawyers by way of 30.10 motion before the Ontario Superior Court of Justice. This means that our lawyers need to go to Court and ask a Judge or Master for an Order to have the complete police file from the accident scene and criminal investigation released to our office, without redaction. Not all cars have the same safety features or safety ratings. Some cars are better equipped to absorb impact from the front or rear. Other cars are more equipped to absorb impact from the side. It all depends on the model, make and year of your car. Still, most cars do not have side curtain airbags, and are not designed to absorb impact from the side door, or to the side of the car. The result can be catastrophic injury to the driver and passenger of the car. The car also has the potential to roll over and cause additional trauma to the persons involved in the car accident. Brain injury, spinal cord injury, paralysis, fractured bones, ankle injury, whiplash, chronic pain, and psychological injury are all possible results following a serious t-bone collision. Many people black out, or forget the moments immediately after their t-bone collisions because they lose consciousness, pass out from pain, or because the events of the accident took place too fast to recall. The most important thing following a t-bone collision is to get proper medical attention for your injuries. The casting of the blame against the negligent driver will take care of itself with the help of the police, or witnesses to the accident. 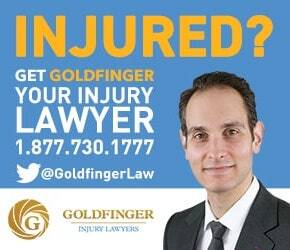 Goldfinger Injury Lawyers has gained a reputation of excellence in representing accident victims with the side collision, or t-bone car accident cases. All of our consultations for these cases are free, and you don’t have to pay any legal fees until your case settles. If you cannot meet with us at our Toronto, London, or Peterborough office, we’d be happy to meet with you at your home or hospital, free of charge. We look forward to working with you and getting you the results which you deserve.